Mix all ingredients & make a soft dough. Leave it to rest for 15 - 20 mins & Make a equal balls. Take a ball, flatten it with roller. Heat Pan, add flatten thepla, cook bothsides evenly with little oil. Serve hot with Dhals or chutneys . Hai srikar the paratha looks yummy.is it taste good by adding besan?I will try this. Love the coloue, healthy and delicous. 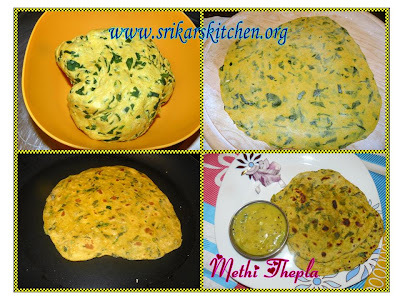 Healthy paratha with methi looks gorgeous! And yes, I am back and am happy too! "thepla"..this name sounds new to me.. 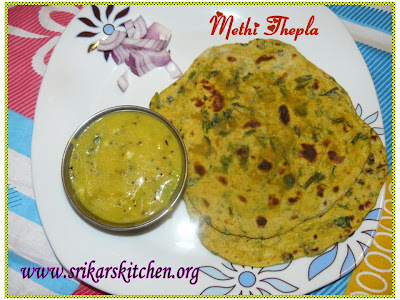 I love methi parathas :)..though havnt tried yet..
yeah mavadu is the tamil name for tender mangoes..since the recipe is stuck to kerala one..I'd given the mallu names :)..
i love thepla.....i buy it from the store and make it. But i will try urs this time!!! !Looks yummy!!! Thanks for visiting our blog and leaving your comment. You have such a wonderful collection of recipes, nice blog. Thepla are looking good, great filling tiffin!